If you live in DC, I really hope you get to work from home on Wednesday. 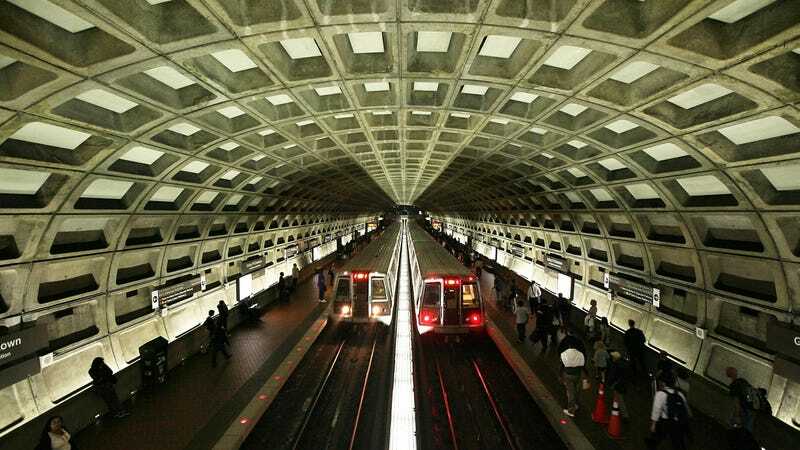 Starting at midnight tonight, the nation’s capital is closing its entire metro for at least 29 hours for a system-wide safety survey of electrical cables. The Washington Post reports that the unprecedented closure is a safety response to a cable that caught fire on Monday, triggering massive delays on three train lines.. Over 600 cables will be checked over the next day or so. Monday’s incident was similar to one last January, when an electrical malfunction near the tracks filled a train tunnel with smoke, killing one passenger on a stalled train of respiratory failure. Wednesday’s shutdown is a precaution to avoid a repeat scenario. If any dangerous cables are found that need fixing, this day-long closure could be extended. So where will all of those drivers go if they can’t work from home? Many will take to the roads and drive to work, which will make the city’s terrible, terrible traffic, which is some of the worst traffic in America, even worse. Update, 5:57 p.m.: Washington Metropolitan Area Transit Authority tweeted that parking will be free in all Metro-owned lots and garages on Wednesday for anyone taking a bus or carpooling.